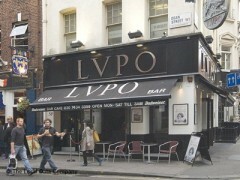 About: Located in the fashionable Soho quarter, Lupo specialises in modern European and vegetarian dishes. They have a late licence, DJs and can cater for private parties of up to 100 guests upon request. Pavement seating is also available. I celebrated my hen night at LVPO last month with a Cocktail Making Masterclass. We all really enjoyed it, Douglas was fantastic; very entertaining and made wonderful cocktails. The cupcakes were great and it was a lovely surprise to find that the cocktails were all half price once we'd finished the class. I definitely recommend it for any special occassion. Excellent staff! WE HAD AN ABSOLUTE BALL ON FRIDAY! What great staff and great music! The reservations team kept me informed and up to date on everything and made sure everything went perfectly on the night. Thanks so much to LVPO for making my birthday a special one! Had a great night at Lvpo on Saturday! Great music and very friendly staff!Celebrated my birthday over there with few friends and was able to get 50%off my bill..would def recommend the place!! Went to Lvpo for my Christmas Party and had a really good time!!! Will be coming back soon...great place!!! This was quite possible the worst bar experience of my life!I was expecting a pleasant night here after fairly good reviews but I was appalled at the aggression of the incredibly rude bouncers as well as the terrible service and horrible atmosphere. I will never come here again and feel it is my duty to inform others to do likewise!